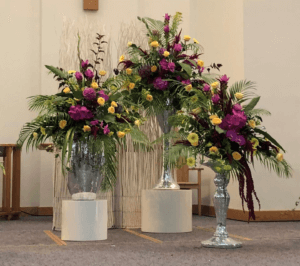 Sandy Bailey is a National Demonstrator and Flower Arranger who has demonstrated in each of the 21 NAFAS Areas which is quite an achievement. After a long and illustrious career Sandy is retiring at the end of 2019. 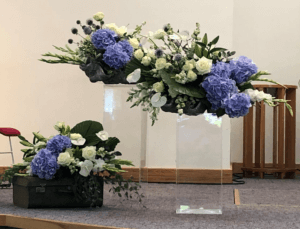 Her interest in flower arranging was first sparked by Fleet Flower Club when she came along to a practice meeting and it was evident that she had a flair with arranging flowers. 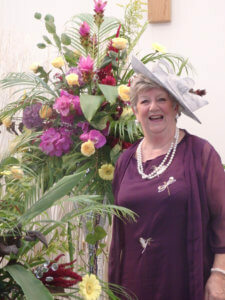 Sandy entered the Club’s Annual Show and won a first prize, quite an achievement for a novice. Later, she then joined Aldershot Floral Design Club where she was encouraged to take the Area Demonstrator Test; at the first attempt Sandy failed but that didn't stop her and on trying again in the Wessex and Jersey Area passed. Sandy was encouraged at all times by National Demonstrator, Dorothy Bye. 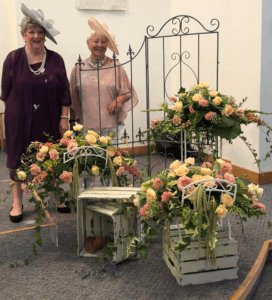 This then set her on the path to prodigious accolades and as part of the Southern Demonstration group won Gold at the Chelsea Flower Show and also prizes at the NAFAS National Show together earning great respect from NAFAS members for her talent and expertise. Sandy wanted to thank Fleet Flower Club for the encouragement they gave her when she first started at the Club. Sandy and her very close friend, Nina Eglington, had afternoon tea at Harrods in London and this gave her the idea for a demonstration. 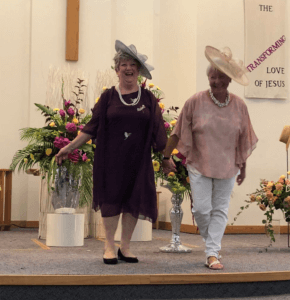 Sandy suggested this may be a good idea to raise the Fleet Flower Club's profile whilst raising funds for the Club and a chance to "give something back". Afterwards for members, friends and family to enjoy a vintage afternoon tea with old fashioned cups, saucers, tea plates and of course cake stands. The venue had to be just right, the Church on the Heath was chosen, and the date set for Saturday 18 August 2018. Tickets were sold, and 88 people attended the event. 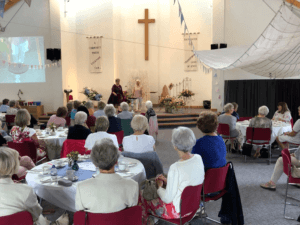 It was a very special and memorable event and from comments as people left, they were very impressed with Sandy's demonstration, ably assisted by Nina, and enjoyed their delicious afternoon tea as well as with thoughts of joining the Flower Club!